Prostate Cancer (PCa) is the second most frequent neoplasia in men worldwide. Previous reports suggest that the prevalence of PCa in Hispanic males is lower than in Africans (including communities with African ancestry) and Caucasians, but higher than in Asians. Despite these antecedents, there are few reports of open population screenings for PCa in Latin American communities. This article describes the results of three consecutive screenings in the urban population of Monterrey, Mexico. After receiving approval from our University Hospital's Internal Review Board (IRB), the screening was announced by radio, television, and press, and it was addressed to male subjects over 40 years old in general. Subjects who consented to participate were evaluated at the primary care clinics of the University Health Program at UANL, in the Metropolitan area of Monterrey. Blood samples were taken from each subject for prostate specific antigen (PSA) determination; they underwent a digital rectal examination (DRE), and were subsequently interviewed to obtain demographic and urologic data. Based on the PSA (>4.0 ng/ml) and DRE results, subjects were appointed for transrectal biopsy (TRB). A total of 973 subjects were screened. Prostate biopsy was recommended to 125 men based on PSA values and DRE results, but it was performed in only 55 of them. 15 of these biopsied men were diagnosed with PCa, mostly with Gleason scores ≥ 7. Our results reflect a low prevalence of PCa in general, but a high occurrence of high grade lesions (Gleason ≥ 7) among patients that resulted positive for PCa. This observation remarks the importance of the PCa screening programs in our Mexican community and the need for strict follow-up campaigns. According to the World Health Organization, cancer causes 7 million deaths worldwide every year and prostate cancer (PCa) is the second most frequent malignant neoplasia. PCa represents the second cause of death due to cancer among Mexican men . As life expectancy of the general population increases in Latin American countries, a positive correlation with the incidence of PCa is also expected . Screenings in these populations are scarce, although studies in Hispanic populations living in the United States report that this heterogeneous ethnic group has medium risk of PCa when compared with other groups. Early diagnosis of PCa can increase the likelihood of cure, although screening asymptomatic men for PCa is controversial due to problems with the screening test (e.g., sensitivity and specificity) as well as the lack of evidence that screening affects population mortality from disease [3–5]. To better understand the prevalence of risk factors and biopsy prevalence of disease, we conducted a population-based PCa screening using PSA and DRE in the metropolitan area of Monterrey, Mexico. We describe the results of three screening efforts. This study was approved by the Ethics Committee of the University Hospital, from the Universidad Autonoma de Nuevo Leon and was thereafter announced by local radio, television and printed press. Men over age 40 who lived in the metropolitan area of Monterrey, Mexico were eligible to participate. Subjects were screened in the primary health centers of the University Health Program UANL located in Monterrey, Apodaca, and Guadalupe (Monterrey's Metropolitan area). Subjects were informed of the potential but unproven benefits and harms associated to their participation in the study. No exclusion criteria were considered for this study. 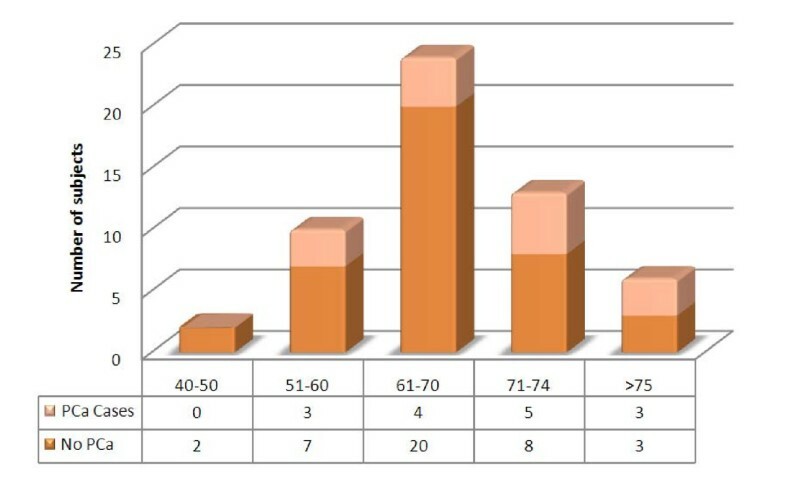 From each participating subject who granted his informed consent, a venous blood sample was obtained for PSA determination, a questionnaire consisting of demographic and urologic data (American Urological Association Symptom Index: AUA-SI) was administered, and a DRE was performed by an urologist or urology resident. If the serum PSA level was equal to or above 4.0 ng/ml or the DRE was abnormal, a transrectal biopsy (TRB) was recommended. Before biopsy, patients were premedicated with 1 gr/day of ciprofloxacin for three days and an enema (450 mg sodium citrate/45 mg lauryl sulfoacetate). The transrectal ultrasound guided biopsies (TRUS) of the prostate were performed under local anesthesia with xilocaine gel using the biopsy system ASAP™ with Channel Cut™ 18 GA needles (length 21 cm with a cutting channel of 17 mm); at least six cylinders were obtained from each patient, this number corresponds to the sextant technique, a standard method practiced in Mexico. The prostatic tissue obtained was fixed in 3.7% neutral-buffered formalin for at least 3 hours, processed overnight and embedded in paraffin according to the standard protocol. Two 5-μm thick sections were performed, and stained with the Hematoxilin and Eosin stain. The slides were evaluated for prostatic carcinoma by two pathologists. All the neoplasms were graduated using the Gleason score. Screenings were performed on July 2004, July 2005, and February 2006. A total of 973 subjects were screened in the study; 709 were entered the study in 2004, 225 in 2005, and 39 in 2006. Most of the screened subjects were from the state of Nuevo Leon: 40% from Guadalupe followed by Monterrey, Apodaca and San Nicolas districts (31, 12 and 9% respectively). Two percent of the subjects were from other districts of Nuevo Leon and 1% from the neighbor states of Coahuila, Tamaulipas, and Veracruz. The mean age of participants at the time of the first screening was 61.9 (range: 40–98). Anthropometric measures indicated 76.5% of the men were overweight with a Body Mass Index (BMI) above or equal to 25, 21% were had a normal BMI (20–24.9) and 2.5% were underweight (BMI below 20). A total of 54% of subjects presented with mild (0–7 AUA-SI) obstructive urinary symptoms while 46% had moderate (8–19 AUA-SI) or severe (20–35 AUA-SI) obstructive symptoms. Table 1 shows age, BMI, and urologic data for the studied population, compared with the data obtained from subjects diagnosed with PCa. Age, Body Mass Index, and Urologic Data for the General Population Screened compared with data from PCa Subjects. * AUA Symptom Index Score Range from 0 to 7. # AUA Symptom Index Score Range from 8 to19. ~ AUA Symptom Index Score Range from 20 to 35. PSA levels for subjects in the screenings of 2004, 2005 and 2006, cases of PCa found, and their Gleason scores. • PSA could not be measured for 12 subjects due to insufficient blood sample. † PSA could not be measured for 13 subjects due to insufficient blood sample. * Prostate cancer cases found only within the 55 biopsies performed in these screenings. In 2006 we found ten subjects with PSA levels above 4 ng/ml. Three biopsies were performed and we found one subject (33.33%) with PCa, Gleason score 8. The PSA determination levels for these subjects are presented on table 2. Overall, fifty-five core biopsies from 124 subjects with suspicion of PCa (by PSA and DRE criteria) were submitted for pathological evaluation and a total of 15 cases of PCa were found in the screenings. The typical features of prostatic carcinoma like a single epithelial layered gland, huge nucleolus and conspicuous nucleoli were observed; some of the glands showed back to back pattern of growth, lymphatic and vascular infiltration; 14 of the carcinomas (93%) had Gleason scores equal or above 7. Sixty seven percent of the subjects with PCa had moderate to severe obstructive symptoms according to their AUA-SI scores. None of the men with prostate cancer had a history of PCa in their families, and only 2 had a family history of other types of cancer (Colon Ca, and Breast Ca). Most of the subjects with PCa (66.6%) were overweight, with a Body Mass Index (BMI) equal or above 25. Only one of these subjects was reported as smoker at the time of the interview and seven (46.6%) were taking nutritional supplements, mostly multivitamin compounds. Table 1 shows Age, BMI and AUA data for these subjects compared with general population. 98 screened patients were older than 75 years (10.07%). The age distribution of subjects that underwent biopsy (Figure 1) shows that PCa was diagnosed in 12/37 subjects from 40 to 74 years old (32.43%), while this tumor was diagnosed in 3/6 subjects older than 75 years old (50.0%). Age distribution of biopsied subjects (n = 55). The only histological type of PCa detected was adenocarcinoma (Figure 2). As for the other histological findings, the most common was chronic prostatitis (51%), followed by malignant neoplasia (27%), benign prostatic tissue (11%), atrophy (5%), chronic prostatitis with secondary acute prostatitis (4%), and prostatic adenomatous hyperplasia (2%). Chronic prostatitis, being the most common diagnosis, was found in association to benign prostatic tissue in 86% of the samples, followed by 7% in hyperplasic prostatic tissue, 5% atrophic tissue, and finally accompanied by prostatic infarct in 2%. Histologic findings in TRB tissue samples from all the screenings (n = 55). Regarding the prostate biopsies performed for the study, 81.8% were due to elevated PSA, while 18.2% were exclusively due to an abnormal DRE. Table 3 displays the false positive and negative rates as well as the predictive values, sensitivity and specificity rates of these tests according to our results. Effectiveness of PCa diagnosis: Accuracy of PSA and DRE. Since PCa is one of the main causes of death among men worldwide, availability of screening tests make early detection an attractive public health option for developed countries. The American Cancer Society recommends offering the combination of PSA and DRE annually to men over age 50 and to men over age 45 for subjects with additional risk factors such as a family history of PCa or African American ethnicity . Our series is the first report of a public screening for PCa in Mexico, most of the participants did not have antecedents of PSA screening neither prostate biopsy for cancer detection. This article illustrates both the ability of such an effort to detect prostate cancer cases of whom many had high tumor grades, as well as the surprisingly high proportion (46%) of moderate to severe obstructive symptoms among Mexican men. The U.S. Preventive Services Task Force (USPSTF) Recommendation Statement established a threshold of age at 75 for PCa screening; USPSTF recommends against routinely providing the screening to asymptomatic patients because found at least fair evidence that screening is ineffective or that harms outweigh benefits . In Mexico, there is no experience about the impact of harms/benefit for early detection screening of PCa in men older than 75 years. In our study, a total of 98 patients were older than 75 years and PCa was diagnosed in 3/6 subjects that underwent biopsy (50%). This reflects the higher incidence of PCa in older men, and accordingly, we do not oversee the benefit of the screening for PCa in this group of men. Only 15 cases of PCa were detected in the screenings. We are aware that this number may be affected by the compliance for biopsy in suspected subject, and additional factors, as the threshold criteria for serum PSA. Higher Gleason scores were common among men diagnosed with PCa and were not unsuspected, given the higher PSA levels among these men. Nonetheless, we also detected Gleason 7 prostate cancer in one of the subjects with a low PSA level. The occurrence of a high grade PCa with lower PSA levels, confirms the need for a serum marker with a higher sensitivity to diagnose this disease. DRE proved to be a screening test with low sensitivity (20%) and specificity (82%). PSA has a respectable sensitivity (93.3%), but a very low specificity (22.5%). These accuracy results support the plausibility of using both methods as complementary in screening efforts. We found no important associations between known risk factors and diagnosis of PCa. The only risk factor present in the majority of PCa subjects in this study was age above 50 (94.73%) and the prevalence of PCa cases by age among biopsied men older than 70 years was higher than in the others age groups (53.33%). Our results are dissimilar to many other screening series in which a substantial number of cases have Gleason 6 or lower grade disease [8, 9]. In this series, the vast majority were Gleason 7 or higher. The explanation for this phenomenon is unknown. Possible reasons may include the low frequency of screenings in the population, but may also reflect the previously-noted lower prevalence yet higher grade of disease among Hispanic men. Regardless, it illustrates the importance and yet the challenge of a screening program in Mexico: the combination of low prevalence yet high aggressiveness would lend a greater interest in biomarkers related to disease prognosis, as even reasonably-good specificity rates may lead to unacceptable rates of unnecessary screening and biopsy. Some limitations for this study must be recognized. A threshold of serum PSA of 4.0 ng/ml was established as criterion for biopsy. Is now clear that the 2.5 ng/ml value of serum PSA is a better threshold for PCa detection, but this study was designed and conducted in a period in which this PSA serum concentration was under study as a parameter for the screenings [7, 10]. The present study does not consider the possible effect of concurrent prostate infections and benign prostatic hyperplasia on the serum PSA concentrations in the screened subjects, as has been described [11–13]. An underestimation of cancer diagnosis in the biopsies may be due to the use of the sextant biopsy technique, the standardize method used in screening cancer programs in Mexico. It has been showed that increased numbers of biopsy cylinders per biopsied patient improve the chance for detection of prostate malignancies in suspected individuals [14–16]. Empiric biopsies in subjects without clinical indication for prostate biopsy render a better estimation of the actual PCa prevalence in any population. We did not performed empiric biopsies in our study. Finally, we recognize a low compliance for the biopsy procedure (44.0%) in our report, but it maybe reflects the historical compliance observed in the Service of Urology of our University Hospital, in which the compliance is 56.6%. PSA and DRE screening tests are associated with elevated false positive rates however the diagnostic yield of PCa is increased using both methods as complementary in screening efforts. Lauro S Gomez-Guerra, Margarita L Martinez-Fierro, Valeria Alcantara-Aragon contributed equally to this work. We thank all the study participants. Written consent for publication was obtained from each patient or his relative. Authors thank Dr. Ian M. Thompson from University of Texas Health Science Center at San Antonio for his aid to set-up the prostate screening program and for his careful revision of the manuscript. We also recognize Mrs. Betsy Higgins for technical and logistic support and the Club Rotario Monterrey Poniente, A.C. for their support during the campaigns. This work was supported by the Mexican Council for Science and Technology (grant CONACYT-SALUD 2005-01-14085). The contribution of each author was substantial for the study, LSG participated in the implementation of the screening campaign and he performed the digital rectal examination and was in charge of the biopsies. MLM was involved in the samples and data collection, processing of the samples, screening coordination, and in the preparation of the manuscript. VAA was involved in the organization, data processing and preparation of the article. ROL participated in the planning of the screening campaign and sample collection. RTM was enrolled in the campaign organization, database registry, and patient contacting. IBM collected samples and interviewed subjects for the epidemiologic and urologic database. RGG and MAP were responsible for the pathologic evaluation of the biopsies. ARM was in charge of the general planning and coordination of the screening campaign and the completion of this study. He helped to write the article and did a careful revision of the manuscript.